Making music with artistry and a wide range of tone colors are the focuses in the versatile career of the acclaimed saxophonist. Whether it is in Carnegie Hall, as a soloist with the Hamburger Symphoniker, or playing chamber music with the Mana Quartet - she is equally at home everywhere. An international education by German and American, as well as French and Asian luminaries are the foundation of her noteworthy sound and style. 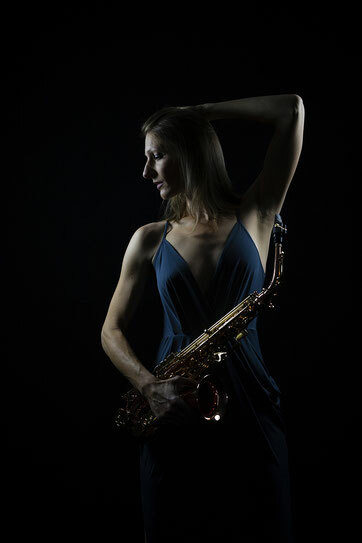 In addition, Diane Hunger also passionately teaches about music and the saxophone as a university instructor and at masterclasses. Most notably the work for a sophisticated sound spectrum was in the foreground. Fascinating, how the most virtuosic and racy runs had subtle colorations, how enthralling and precisely the music was played, how one and the same tone received again and again various shadings. The 'Concertino da Camera' by Jacques Ibert … was masterfully played by Diane Hunger. Fast runs into the highest register alternated with darker more poetic passages. In the encore Diane Hunger gleamed with a poetic solo, which rendered much applause. Before twisting Ibert’s bustling motives to dizzying heights, the soloist demonstrated in the middle part of the Concerto – as well as in her little encore, the troubadours melody from Mussorgskis 'Pictures at an Exhibition' - , how you can sing on an alto saxophone. The young artist succeeded in exquisitely rendering the virtuosic composition.